Whisk together butter, white sugar, brown sugar and vanilla. Mix in the mashed bananas. Add in the baking powder and flour and mix until combined. Bake at 375 for 15 minutes. These cookies are a delicious way to make use of your mushy bananas if you’ve just had too many Chocolate Chip Banana Muffins lately! Mix bananas, egg, sugars, vanilla, and butter in large bowl. Add oats, flour, cinnamon, baking soda, and salt, and mix well. Allow dough to chill for a few hours (or days) in the refrigerator. Place mounds of dough on cookie sheet and cook for 10-15 minutes, until the edges are noticeably brown. These peanut butter cookies are for those who like some extra crunch and sweetness. Melt butter and stir in peanut butter. Add egg and vanilla and mix well. Add flour, sugar, baking powder, baking soda, salt, oats, and water. Mix in mini chocolate chips. Scoop spoonfuls onto an ungreased cookie sheet and flatten so that cookies are about 1/2 an in thick. Bake at 375 for 10-12 minutes or until dark brown on the edges. Sugar cookies are one of the most versatile desserts because they can be decorated in so many ways. 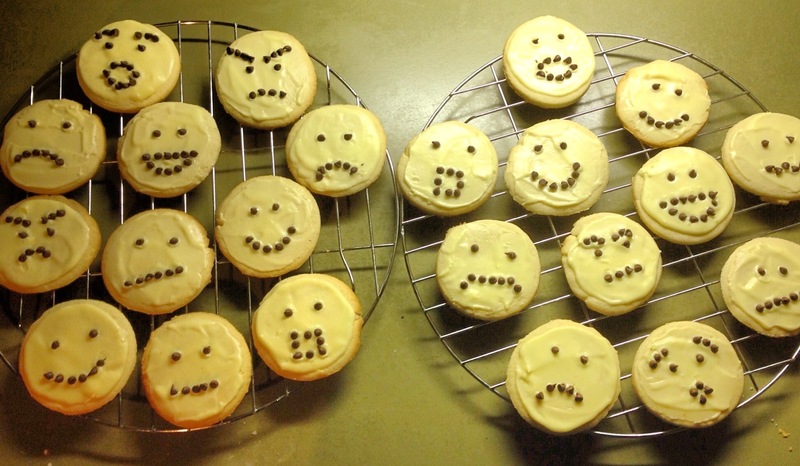 We made these cookies for a psychology lab meeting, hence the different facial expressions on each cookie (adorable, right?). This recipe makes about two dozen 2-inch sugar cookies and enough icing to frost them generously. Beat softened butter until light and fluffy. Add half the flour (1 cup) and beat well. Add egg, sugar, baking powder, milk, vanilla and salt. Beat well. Mix in rest of flour. If dough is too sticky add a couple more tablespoons of flour. Divide dough in half and flatten each half into a disc about an inch thick. Cover with saran wrap and refrigerate for 1 hour, or until firm. Sprinkle flour on a hard surface and roll dough until about 1/4 inch thick. Use cookie cutter, rim of a cup, or your hands to make into desired shape. Bake on an un-greased cookie sheet at 375 for 7-9 minutes. Allow to cool fully before putting the icing on. Melt butter and slowly stir in powdered sugar, milk and vanilla. Mix well. Continue to add more powdered sugar to make a thicker consistency, or if it is too thick then add more milk. Spread evenly on cookies after they have cooled and decorate however you’d like!